“Our Amazing Journey” from Christian Faith Publishing author Gary Lee Van is the unforgettable true love story where best friends become lovers and soul mates for life; the author looks back to recognize God’s divine intervention at several points in their lives, how even through the peaks and troughs of their four decades of separation, the truth would not go away: Gary and Kathy were destined to be together, and this book tells the story of how God brought it about, like a real-life fairy tale. “Our Amazing Journey”: a heartwarming true love story. 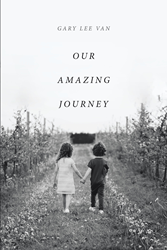 “Our Amazing Journey” is the creation of published author Gary Lee Van, a Christian musician and aspiring children’s book author who lives in Bethalto, Illinois, with his wife of eight years. Van shares an early memory with the love of his life, “The next event I can remember is the trip my family made to visit the Moulton family in Illinois. I was four at the time and I can remember it, just like it was yesterday. Katie’s family was living in the tiny little house in which my parents helped them move into. Katie and I were riding tricycles up and down the driveway when all of a sudden, Katie took off down the road and disappeared around the corner. Published by Christian Faith Publishing, Gary Lee Van’s new book is a joyful celebration of two lives interwoven by God’s hand. Tracing the journey from their earliest memories growing up together as best friends, the decades of separation as teenagers, and how they found each other again, readers will come away touched to tears and awestruck at God’s orchestration. View a synopsis of “Our Amazing Journey” on YouTube. Consumers can purchase “Our Amazing Journey” at traditional brick & mortar bookstores, or online at Amazon.com, Apple iTunes store, or Barnes and Noble. For additional information or inquiries about “Our Amazing Journey”, contact the Christian Faith Publishing media department at 866-554-0919.